Canterbury Cathedral, St Augustine's Abbey, and St Martin's Church represent the introduction of Christianity to the Anglo-Saxon kingdoms. St.Martin's Church is England's oldest parish church in continuous use. It was the private chapel of Christian Queen Bertha of Kent in the 6th century before Augustine arrived from Rome. St. Augustine Abbey was founded in 598 by the Benedictine monk Saint Augustine on a mission from Rome. Its influence was decisive throughout the High Middle Ages in England. Now only ruins are left. Canterbury (Christ Church) Cathedral was also founded by Augustine, in 602. In 1170 Archbishop Thomas Becket was murdered in the Cathedral and ever since, the Cathedral has attracted thousands of pilgrims. It is now the cathedral of the Archbishop of Canterbury, leader of the Church of England. The building is also rewarded for the beauty of its architecture and early stained glass windows. Canterbury is a fairly small and cosy university town at the southeastern tip of England. I heard French and Dutch spoken in the streets, proof of the proximity of the European mainland: at nearby Dover the ferries from France dock and the Eurostar train terminal is at Ashford, 20 kilometres away. This link to Europe also is what brought WHS status upon Canterbury's monuments: historic and symbolic stepping points in the spreading of Christianity to England from the mainland. The story starts with St. Martin's Church, a tiny parish church. Christian communities already existed in England in the first or second century, but they practised separate from the Church of Rome and paganism still was abundant on the island. In the 6th century St. Martin's became the private chapel of Queen Bertha of Kent. Queen Bertha was a Christian when she arrived in England and her husband King Ethelbert allowed her to continue to practise her religion in an existing church in use in the late Roman period. This church is still in use nowadays, making it the oldest in England. There's an old cemetery and some tall trees, I found it a bit spooky wandering around on my own. Not far from St. Martin's are the ruins of St. Augustine Abbey. It was founded in 597 by (Saint) Augustine, who had been sent by Pope Gregory I to England to revive Christianity. The exact site has seen many uses since then, from a Benedictine monastery to a palace to a hospital. It has slowly fallen into disrepair. Its ruins are now locked behind large walls to prevent any further damage. Opening hours are limited (especially in winter), but I managed to get in on a Sunday morning. There's an informative exhibition on show about St. Augustine and there are rather good views over the town's historic sites. 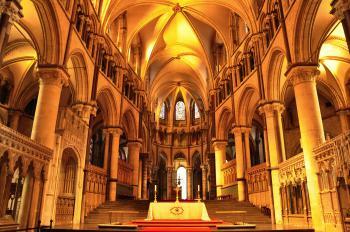 The number one landmark of course is the Cathedral at the heart of Canterbury's old town. Its origins can be traced back to the time of St. Augustine, although the current building mostly dates from the 11th century. It is the Cathedral of the Anglican Archbishop of Canterbury, the religious leader of the Church of England. In this, it symbolizes the different path Christianity has taken in England (with the abolishment of papal authority by King Henry VIII in 1534). The Cathedral also is acknowledged for its Gothic art, among which are fabulous stained glass windows. In all, Canterbury is a good day trip from London or the mainland. Visiting the three sites that are part of the WHS will give you a good introduction to how Christianity came to England and how it developed. I visited Canterbury in August 2015, beginning with a drink outside Christ Church Gate to the is mixed Romanesque and Gothic cathedral that is the seat of the most senior figure in the Church of England. The crypt held quite a surprise for me, as I was not expecting to see twelfth century frescoes in a C of E cathedral. The paintings, located in St Gabriel’s Chapel, were painted long before the C of E was created under Henry VIII, and the chapel was bricked up soon after its creation. It was discovered in the late nineteenth century, with restoration work finishing only in the 1990s. The frescoes put me in mind of the crypt at the Basilica of Aquileia. St Augustine’s Abbey is a ruin, wrecked by Henry VIII in the Dissolution of the Monasteries. I didn't find it greatly interesting, I'm afraid. St Martin’s Church, a ten minute walk up the road from the abbey, is an unassuming little building that looks like any other English parish church. It dates back to slightly before the abbey – so old, in fact, that Roman bricks have been found to form part of its structure. It is the only free-to-enter site of the three, and is a charming oasis of calm that is overlooked by most tourists to the city. Visited Aachen cathedral last Sunday, open and welcoming to all ... and then Canterbury the next day. Judging by the way it is difficult to even walk round the cathedral without parting with a substantial amount of money one may conclude that it is run by a firm of accountants or bankers. By the cozy high speed train service from St. Pancras Station in London, within one hour, I was wandering in the ancient town of Canterbury, admiring its surprisingly well preserved but lively old town with many shops and restaurants around its famous cathedral. It was quite strange that at first I could not find the cathedral since it was well hidden behind the row of shops until I noticed the impressive cathedral gate by the group of tourists waiting to pay entrance ticket! When I entered the Cathedral precinct, I was welcomed by the sheer size of the cathedral and the cheer voice from hundreds of students on the field trip! To avoid the crowd, I had to see the cloister first which brought me a chance to admire the cathedral's front entrance which adorned by statues of many famous historical figures including Queen Elizabeth and Queen Victoria. I was quite disappointed with the cloister; however the chapter house was very beautiful with intricate ceiling and stained glass windows of many well known religious men including the famous King Henry VIII! Then I entered into the cathedral, it was quite overwhelmed by the size of the place and countless of arches of Trinity Chapel, which was the shrine of Saint Thomas Becket. 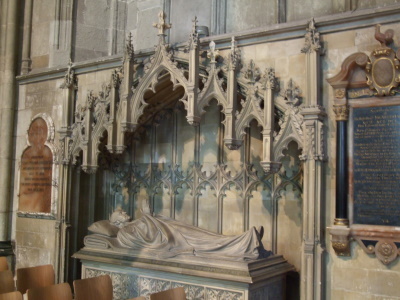 My top interest was the tomb of the Black Prince which I read from the newspaper that the tomb was a victim of stronger UV ray so that the cathedral has to install the blind at the window to protect the tomb. Interestingly I asked many volunteer guides about this matter but nobody knew and one guide even surprised when I pointed to the blind as he did not know the existence of that blind! Another beautiful piece of art is the gothic choirs together with it screen that is so large that making the Trinity Chapel separated from the other part of the cathedral. 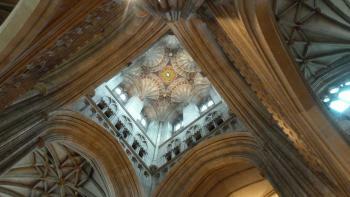 The nave of Canterbury Cathedral is very high and the ceiling is very interesting for the vey intricate vaulting. Before I enter into the crypt, I was recommended by a guard to see somewhere else as currently the crypt was full with hundred of noisy students! I had no choice so I had to change plan to visit the city of Canterbury instead. At first I planned to see the St. Martin Church, but found out to be closed, after had lunch and some more city sightseeing, I decided to go back to London. In my opinion, Canterbury is a nice place to visit, and the cathedral which is the center of Anglican Church is far better than my expectation. During my two and a half week vacation in England I saw three English World Heritage listed religious buildings, Durham, Westminster and Canterbury, while I preferred Durham for its right architectural proportion and impressive surrounding, Canterbury is equally impressive with interesting mix from Romanesque to late Gothic together with many legends and background history making Canterbury Cathedral to be not just another cathedral, but a must place to visit in England. I went to Canterbury on december 20th, 2008 with a buscompany. We crossed the channel with a ferry and 20 minutes later I stood in Canterbury. I really liked the cathedral, from all the churches and cathedrals I've seen I like this one the most. It has an interesting architecture, a nice environment filled with nice buildings, a lot of history (Thomas Becket), the graves of members of the royal family (the black prince and king Henry IV), an interesting crypt,... I used the audioguide which was insightfull. And since it was christmas I could enjoy the nice nativity scene in front of the cathedral. I also managed to hear a bit from the evensong at 15.15h, Which I really enjoyed. The solemn music of the choir combined was really nice. Sadly I missed the small ceremony of the bells at 11.00. After the cathedral I visited St. Martin's Church, a short walk from the cathedral. I was fortunate that the church was open that day, although it isn't too spectacular on the inside, although the cemetary has a nice midevil feel to it. St. Augustine's abbey is an interesting site, quite peacefull, kinda like you're in an open field, where you can walked around very relaxed. I certainly liked it. I learned a lot about the christian faith in the UK by visiting this site. Ow and there was some time left too for shopping. I have been to Canterbury Cathedral many times, and yes, it does cost to get in. There is one obvious exception to the admittance fees-actually attending services (what this magnificent church is intended for). When compared to some of the other CofE treasures (Westminster Abbey, St. Paul's Cathedral in London) here, you get to actually stop and admire the sheer craftsmanship, without being herded around. THAT alone makes this a jewel in the crown. Some spots not to be missed, the site of the Tomb of St. Thomas-though there is only a candle marking the spot, look closely at the floor, and you can see the indentations from centuries of kneeling on the floor at the shrine-a reminder that you are only one of millions to come to this place. There is also a window that gives an idea of what the shrine actually looked like before being destroyed-it reminds me of the tomb of St. Edward-the Confessor (Westminster Abbey). The Bell Harry Tower, just look up! Wow. The grounds of the Cathedral have some interesting ruins to look at. Make your visit personal, walk around, make the time to take it all in, ask questions of the staff, they have always been helpful, and knowledgeable. Get your money's worth from your visit! Who knows, perhaps this wonderful place will inspire you. I have never visited England; however, I have a lithograph of St. Martin Cathedral, handed down to me. I understand it is unique in that it was told to me to be one of the first, if not original, colour lithographs. It's been in my possesion for more than fifty years. It was in my husband's family for more than fifty years. I cannot descern the name of the artist. I've removed it from it's frame and glass, it is really quite lovely. I'd appreciate any information....thank you! Canterbury is one of the most important places in Britain from a historical, religous, and archaeological point of view, and it makes a worthwhile daytrip from London or a convenient stopover on the way between London and Dover. Christ Church Cathedral, the seat of Canterbury's Archbishop and the centre of the Anglican Church, is just huge and can be seen from a great distance. It's interesting, but overall I felt that except for its sheer size, there's not that much to distinguish it from Britain's many other cathedrals, some of which I thought were better and even more interesting (Durham, for example). I enjoyed St.Martin's a lot more, Britain's oldest church, where you are likely to be the only visitor and can take a closer look at the building and the surrounding cemetery. St.Augustine's Abbey seemed to be not much more than a collection of ruins, but you can see much of it from the outside of the archaeological area. All in all, a great place for a visit. The Cathedral is exceptional and is the pinnacle of the Church of England. The complex itself is huge and I easily spent a full afternoon walking around it. The Cathedral has been a place of pilgrimage for the last 800 years due to the murder/ martyring of former Archbishop Thomas Beckett and the areas associated with this are some of the most poignant I have ever borne witness to. The architecture is impressive as this was the first Gothic construction in the British Isles and there are plenty of additional aspects such as the Cloister which add to the building. The other parts of the site are a bit further out from the centre both on the same road. The first is St Augustine's Abbey which was closed when I got there but I could see in and there seemed to be a reasonably large set of ruins to view. About 100m further on is St Martins church which was small and very pleasant with some nice views back to the Cathedral, it is also the oldest church in Britain alas this was closed as well as I spent so much time in the Cathedral itself. The city of Canterbury is nice and due to its closeness to London and Dover has a lot of foreign tourists giving it a nice cosmopolitan feel. It is easy to reach the city with regular connections from London, the channel port of Dover and the Eurostar terminus at Ashford is only 20km away. I visited both the Cathedral and St Martin's. The Cathedral was beautiful and fascinating. I spent hours examining what I thought was every nook and cranny only to find that I still managed to miss some things. The cloisters and the crypt completely absorbed me. St. Martin's was extremely interesting and a very intimate experience. I was the only visitor in the church and was treated to a personal tour and history of the church by a volunteer from the parish. He was extremely knoweledgeable and very, very interesting. I have to admit I only came upon St Martin's by accident, if that gentleman hadn't been there, I may have walked away not realising its importance in British religious history. I tried to visit the abbey, but discovered that is closed on Mondays and Tuesdays during certain months of the year. I was bitterly disappointed because I only had one day in the city, but it did look very interesting from afar. I visited Canterbury Cathedral and St Martin's Church on Remembrance Day, Sunday, 11 November 1976. I attended the Choral Eucharist at eh Cathedral and vividly recall the eerie, but breathtakingly beautiful sound of the men and boy choir that sang the Mass. After the service, I walked to St Martin's Church. The day was cold with a hazy sun. When I entered the church, I was overcome with tears because St. Martin's was the parish church of my grandfather, Charles Murphy, a native of Canterby. Grandpa Murphy sang as a boy chorister at St Martin's. Visiting my grandfather's church, the oldest Christian church in continuous use in England, was an unforgetable experience. The Cathedral is a very large complex and well worth the admision fee as you could comfortably spend a few hours exploring it. For me it was also a deeply spiritual experience, I am not a religiouse person but the poigniancy of the areas associated with Thomas A Becket really affected me. The other sites inscribed on the list are not to far away either they are about a 10 minute walk from the Cathedral, The Abbey has an entrance fee but was closed when i got there at 5:30 but you can still look in, St Martins church is a few minutes further on and is quaint, but is impressive as it is the oldest Church in Britain. The town of Canterbury itself is really lovely and has much more to offere than just the Cathedral, it also has a much more European feel as it is easily accesable from Dover and Ashford so in easy range of both ferries and Eurostar Trains. Christian Pilgrimage Sites: Cathedral associated with Saint Thomas Becket. 361 Community Members have visited.